The first day of the Pennsylvania 2013 buck season . I exited the car as the hands of the clock approached the seven o’clock time. I started hunting as I walked up the hill. Eventually, I settled in to sit and watch for animal activity. I saw my first buck around 7:30. The rack wasn’t all that big so I didn’t even attempt to count the points. 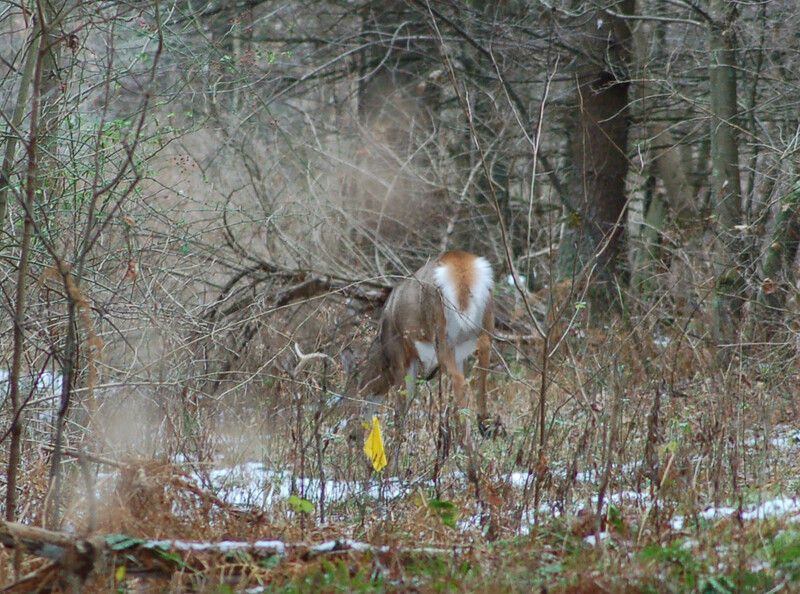 A short time later I saw another small buck. I still hunted up a slope and witnessed a half rack moving fast. Something scared him! In a few moments I could see a nice-sized rack moving in the brush. I tried to count the points, but wasn’t sure enough to shoot. I back-racked an circled in hopes of seeing him in better conditions. I didn’t. Later in the day I would see another small buck at this area. Later, I visited Bob, my step-father, to see if he was seeing anything. he hadn’t seen any deer at this time. I went back to the original area and began seeing does. Two does came through with a nice-racked buck on their tails. remember it is the rutting season. (Mating season.) he came close to me, but try as I did I couldn’t see the legal amount of points needed to make a shot. I did get a few photos of him. They went down the hollow and a half hour I heard a shot. Did someone shoot this deer? 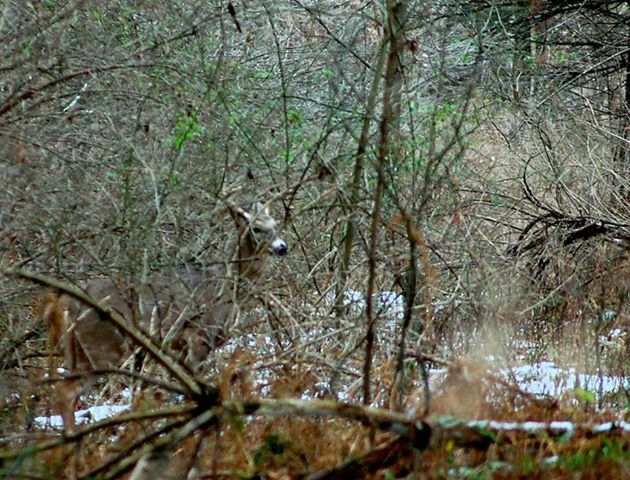 I was sneaking along and spotted two deer coming through the brush. Does! I then saw a third trailing behind. It was a buck and, although, I couldn’t count points I could see a decent-sized set of antlers. I saw these same three again at the same place going in reverse about a half an hour later. All in all, I saw seven buck this day and twenty four deer in total. I saw a grouse and plenty of squirrels too.